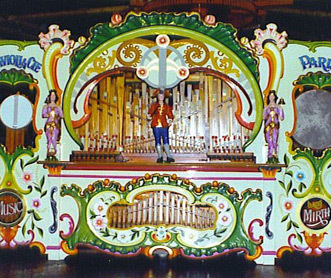 This fine instrument with its richly carved facade, 350 organ pipes, bass drum, snare drum, two bellringers, xylophone and cymbals all operate by folding cardboard music. Built by the firm Gavioli that was founded in 1806 in Italy and moved to Paris in 1845 until their demise in 1910. 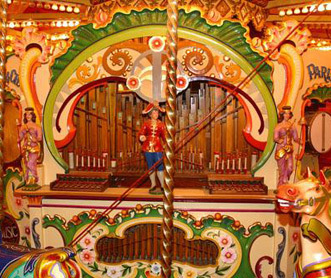 The most famous and prolific of fair organ builders, they also had a large factory in Waldkirch, Germany. It is from here that this organ originated in the early 1900s. Referred to by collectors as a “Black Forest Gavioli”. The organ’s history is fascinating. 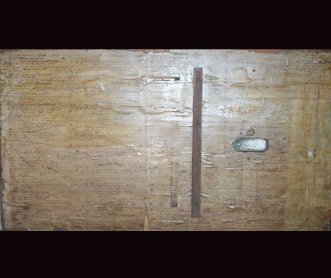 The inside of the reservoir is lined with Gavioli ledger sheets of 1854 and the signature of the organ builder renovating the organ in 1906 is throughout.